It can be easily screwed onto an electric grinder and can easily sharpen chains and serrated blades. Material: high speed steel. Easy for apply and use. Color: as shown. Anyway we will try our best to avoid this kind of thing. High quality and easy to use sharpener that fits onto the guide bar to sharpen the saw chain. 1 Manual Chain Sharpener. For manual precision saw chain filing. Suitable for all sizes of saw chain, all you need to fit is the correct size of round file to suit your chain. Chainsaw Sharpening Tool Kit is used to sharpen your chainsaw easily and quickly. 3 round files sizes: 5/32"(4.0mm), 3/16"(4.8MM), and 7/32"(5.5MM) for a pitch of 3/8"LP, 0.325", and 3/8". 1 Depth Gauge Tool. This PFERD filing tool is the size for sharpening 3/8" and. 404 pitch chainsaw chain. Check it out on YouTube search "PFERD CHAIN SHARP CS-X". Change from left to right tooth without conversion, simply change from left to right by turning the device. Driver bit sockets 3, 4, 5, 5.5, 6, 8, 10mm. The kit also includes filing instructions. PART NUMBER 5605-773-5503 NEWER SUPERSEDING PART NUMBER (NOT FOR SALE) IS 7010 871 0405. Best Buy Mowers Title- Sthil Round File 200mm x 3.5mm Our Price: £9.00 Box of 6 Genuine Stihl Round file 3.5 x 200 mm. For fixing into timber to hold the guide bar steady whilst filing the saw chain whilst on the saw. Weight 380 grams, overall length 125mm & overall width 75mm. The Small Print. THIS ONE IS FROM STIHL and is GENUINE. Fits Stihl models: All saw chain that is 3/8" PM, 3/8" PMN, or 1/4". Husqvarna Part # 505 698 194. Motor: 12V. PC Material Cover: high impact polypropylene 20°/25°/30° angle guide. 5.5mm round chainsaw files for woodwork. 3pcs Round Chainsaw Files. Made of bearing steel, durable to use. Start to fill by tightening the tension in the chain to firmly support and file cutters from inside out the cutter. A 230 Volt 230 Watt CE approved quality heavy duty bench mounted saw chain sharpener. For Full Profile 3/8" and. 404" a 145mm x 22.3 x 4.7mm stone is supplied and for 3/8 LP and. 325 a 145mm x 22.3mm x 3.2mm. Chain Saw Grinder Handheld 12V Volt Electric Filing Sharpener 5/32" 3/16" 7/32"
This quality grinder is perfect for DIY and use on site and provides an economical way to sharpen all saw chain sizes 1/4", 3/8LP. 325, 3/8 &. 404 chains. Part Number. 5pc Diamond Chainsaw Sharpening Rotary File Burrs 5/32"
1/8" shank allows you to use these in any tool or drill for fast and easy sharpening. A CHAINSAW SHARPENER WITH ITS OWN ELECTRIC MOTOR. FORGET ABOUT THE HASSLE OF FITTING YOUR ELECTRIC DRILL INTO A LESSER GADGET, THIS UNIT IS FULLY SELF CONTAINED AND IS CAPABLE OF SHARPENING ALL COMMON CHAINS. Stump Vise Tool is used for fixing into timber to hold the guide bar steady whilst filing the saw chain whilst on the saw. 1 Stump Vise. Dual points for driving into wood.Tightening wing nut locks onto chainsaw bar. 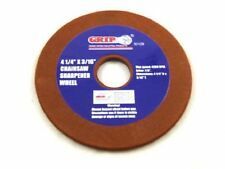 5 Chainsaw File 1/4"" 6.4mm Oregon 70501 Chain Saw Sharpen. Premium files made with the finest steel using state-of-the-art production and finishing processes for best hand sharpening results on your saw chain. Quick, easy and safe way to sharpen a chainsaw blade. Fitted with a or - 35° tilting vice. Will bring life back to blade, enabling safer cutting and limiting snagging once fitted back to the machine for use. DRIVES INTO A STUMP AND HOLDS YOUR BAR IN PLACE TO MAKE FILING EASIER. Tightening of the chainsaw bar with the minimal effort. Machined service for a more effective locking of the chainsaw bar. GREAT FIELD TOOL FOR SHARPENING ON SITE! 1 x Chainsaw Chain Sharpener. Power: 55W. ● Fitted with 12V plug with battery clip adapter supplied. ● A durable, economical tool that makes hand-sharpening easier. 1 set x Tools. We will try our best to reduce the risk of the custom duties. Includes four sharpening stones 5/32, 3/16, 7/32 and 4.5mm Sharpens 1/4". 325", 3/8" and. 404 pitch chains. Easy to use powerful motor, runs on any 12 volt auto type battery. 12 volt grinder with cigarette lighter plug. Husqvarna 325 Sharpening Kit. Condition is New. Dispatched with Royal Mail 2nd Class. Fits Stihl models: 1/4" - 3/8" Picco saw chain. THIS ONE IS FROM STIHL and is GENUINE. 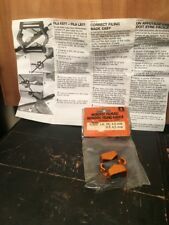 Stihl 2 in 1 Easy File Chainsaw Chain Sharpener 3/8 P + Bonus Replacement File! STIHL 5605-007-1029 complete filing kit contains a filing guide, round file with handle, depth gauge tool, flat file with handle, and a tool pouch. Filing and sharpening for saw chains. Genuine Stihl Part. Practical tool for quickly sharpening the teeth and depth gauge in a single action. Ideal for occasional users. For 3/8" P chains. Suitable for sharpening circuits 36 RM, 36 RS. The STIHL grinding tool kit is used as a tool for sharpening chain saws. Reliably fixes the height of the file, and also shows the desired angle of sharpening. For sale is a NEW Heavy Duty 7" stump vise for sharpening chainsaws out in the woods or on the bench. The vise works good to hold your saw while you file your chain. The vise will work on any chainsaw. Our electric chain saw sharpeners chain vise adjusts to all chain designs and pitches. It can easily be mounted to a bench vise or wall. The chain saw sharpener has an heavy duty steel base with a large side safety guard. THIS ONE IS FROM STIHL and is GENUINE. 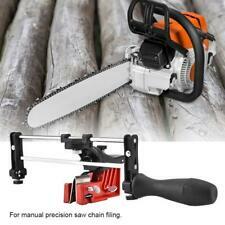 Fits Stihl models: All Saw Chain. SPECS: 12V battery connectors. MADE IN USA. 4 Chainsaw File 5/32" 4.0mm Oregon 70504 Chain Saw Sharpen. Premium files made with the finest steel using state-of-the-art production and finishing processes for best hand sharpening results on your saw chain. PART NUMBER 558488. OREGON TYPE 91PX SAW CHAIN IS FITTED. NEW OREGON CHAINSAW FILING / SHARPENING KIT IN FABRIC POUCH. BAR OIL HOLE / RAIL SCRAPER CLEANER. ROUND 4MM FILE INC HANDLE & FILING GUIDE.